The leaves are falling quickly and the other day I was standing on a deck in Orwigsburg and it started sleeting. Already. It’s supposed to snow here on Thursday. Well I may not be ready for sleet and snow yet, but it’s coming, and so is the seasonal slow down. Every year buyer traffic starts to slow in late August and September, then drops of quickly in October and November until we get through the holidays. For the past two years I’ve been telling you it’s a strong seller’s market with lack of good inventory for buyers in Schuylkill and Berks Counties. That started to change this summer. In fact, the seasonal slow down started over a month earlier than “normal”. 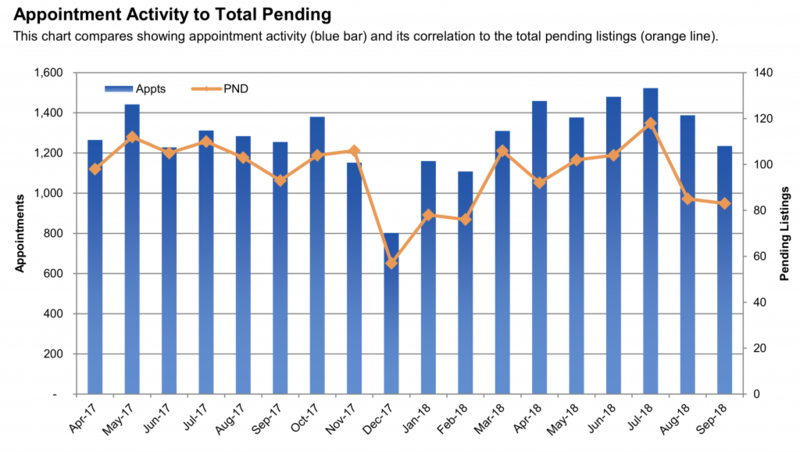 We saw showing requests drop off in July, earlier than we normally see this happen. Pending sales also slowed down at the same time. Many experts believe we’re headed for a turning of the market. It’s inevitable. Real estate sales are cyclical. They go up and down depending on many things, including the economy, interest rates, supply of housing, and local variables as well. We couldn’t stay in a strong seller’s market forever. Right now, we’re settling into a balanced market, but by next spring we may be swinging into a buyer’s market again. Higher interest rates scare young and weaker buyers out the market, as they are priced out of the houses they want and may no longer be able to afford. Shaky stock markets scare older and more settled buyers out of the market, as they worry about their savings and the future.